This recipe looks complicated, and indeed seems so at first glance. Once you have made it a couple of times, it is quite easy to prepare. It is best to start this process of making this dish in the morning, as you will see below. The process is long, but the amount of actual work is minimal. This recipe came to The Artisan from the world renowned chef Massimo De Francesca. We like this recipe so much that we have posted it on our Home Page twice! 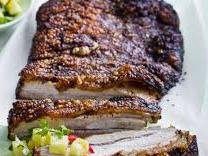 Finding a fine pork belly is not difficult to do if one has a decent butcher shop, or a supermarket that special orders meats. Part of the experience is finding just the perfect belly, and deciding what to do with it. We made this dish with ours, and we made Pancetta as well. 1 2-4 Lb Pork Belly – We used a 2 pound piece when we made it. Pre-heat the oven to 275-290 degrees F.
Set aside 1/2 of the Salt and the 1/2 Pepper. Put the rest of the dry spices in a small bowl and mix well. Set aside. Score the fat side of the belly with a sharp knife. Scores need to be about 1/4 inch apart. Rub all of the seasonings into the fat side of the belly, being sure to push them into the scores. Turn the belly over and rub the rest of the seasoning mixture into the meat. Set aside for 2-3 hours to allow the spices to flavor the meat. After the 2-3 hours remove the belly from the dish or container. Add the smaller amount of olive oil to a large heavy bottomed pot, and turn the heat on to medium.. Place the belly into the pot and sear it on both sides – about 5 minutes per side. Once the belly is golden, and well seared, remove it from the pot, and set aside. Add the rest of the olive oil to the same pot, then add the vegetables. Sauté the vegetables in the oil for about 5-10 minutes stirring from time to time. Add the remaining salt and pepper to the cooking vegetables. De-glaze the pot by adding the wine – all of it. Cook until the wine is reduced by half. Return the pork belly to the pan and add enough broth (or other liquid) to cover the belly. Add the rest of the fresh herbs and the orange slices. Cover the pot if one came with the pot, otherwise cover the pot with foil. Braise in the oven for 3 to 3.5 hours. Check each hour to assure that the liquid level is sufficient to almost cover all of the belly. Nothing else but watching the belly as directed is necessary. NOTE: We did not cover the pork belly when we made it at home. We cooked our belly at 275 degrees F. rather than the 350 degrees F. that Massimo suggested. Either way works fine! Remove the belly once it is cooked and allow it to cool. Strain and save any liquid to use the next day when re-cooking the belly. Once cool place the belly in a glass baking dish. Place a second smaller glass baking dish over the belly and press down as hard as practical. We used plastic wrap to keep the dished pressed together. 4 sheets from a roll worked nicely, was neat and there is no mess to worry about when we placed it in the refrigerator to cool overnight.